I’m moving into the archives for an up and coming photo project on the Streets of Glasgow. When I first met Ian I was wary, immediately jumping to a conclusion based on what I could see, a natural yet unfortunate trait in humans, however, the fates intervened and we started to chat… he told us his life story in a short 15 minutes… by the end I was impressed at his fortitude and character and wondered if I would have been so down to earth with an absence of bitterness! 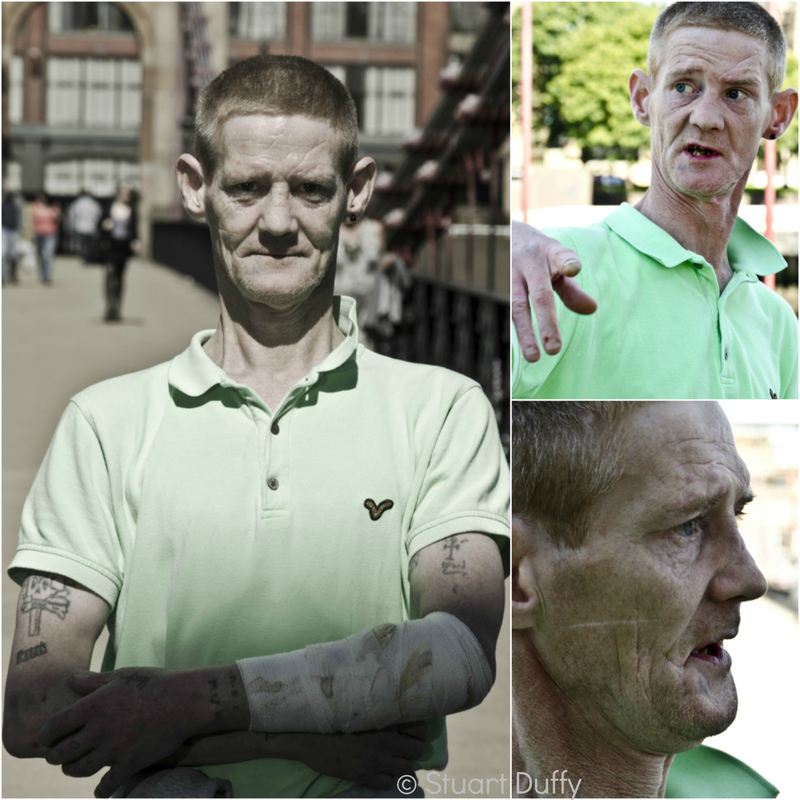 Whilst doing a photoshoot in Glasgow I met someone… it was a very random day… Meet Iain 37 years old, ex army… you can tell he had a hard life and we were lucky enough to get an insight to his life today… 3 months ago he had been homeless for about 6 months… he had been stabbed twice a few days ago in his arm defending his wife, he had met sleeping rough under a bridge, spent two days in hospital and when he got home he was arrested by the police for what I believe was a theft from a shop charge. He had just come away from the court and was walking home to the other side of Glasgow – he had a 10 mile journey he needed to make on foot because he didn’t have money… he didn’t ask for any either. I found him friendly, engaging, funny, he had a great outlook for someone who has had a life I can’t imagine and he was a typical Glaswegian… This wasn’t his whole story, I liked him! I changed my opinions in 15 minutes… he reminds me to keep an open mind!